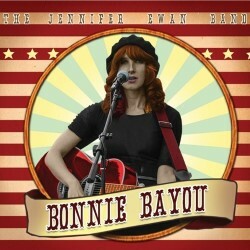 The Jennifer Ewan Band is back with another exhilarating melting pot of heartfelt original songs and old-time Louisiana Creole and Cajun dance classics. As well as performing beautiful new Scottish pop, this upcoming songwriter and her bayou band demonstrate an easy familiarity with the older dance music of the swamps of rural French Louisiana – featuring Cajun blues licks from accordionist Kim Tebble and swamp-pop grooves from Simon Fildes on bass (Both Deaf Heights). 'Just brilliant – music of the highest quality – a Scottish rising star' (BBC Radio Scotland). 'Sassy cocktail of Cajun and modern sounds' (Metro).